France’s economy minister says he expects the future chief of Renault to consolidate the French automaker’s alliance with Japanese partner Nissan. Bruno Le Maire was alluding to the Renault board’s looming selection Thursday of a new president to replace former Renault-Nissan boss Carlos Ghosn, who was jailed in Japan for allegedly falsifying financial reports and under-reporting his compensation. There aren’t many people, if any at all, who spend 32 hours on a train to get to the World Economic Forum in the Swiss ski resort of Davos and then sleep in a tent. Someone who did is 16-year-old Swedish schoolgirl Greta Thunberg, who was given clearance to miss classes at her Stockholm school to push climate change to the top of the global elites’ agenda. Thunberg has become her generation’s voice on climate change after inspiring students around the world to go on strike to relay their anger and angst over global warming. Britain’s departure is set for March 29. Speculation has grown the British government may seek a delay since Parliament rejected Prime Minister Theresa May’s Brexit deal with the EU. Japan’s economy and trade minister says his country still sees a lucrative foreign market for nuclear technology and plants despite the recent decision by industrial heavyweight Hitachi to freeze a project in Britain. Last week, work on the Horizon Project nuclear power station in Britain was suspended after Hitachi said it couldn’t reach a financing deal with the government there. Hitachi executive Chairman Hiroaki Nakanishi noted recent “failures” in construction of power plants that have doused investor interest. China’s vice president took not-so-veiled shots at President Donald Trump’s aggressive trade policies in a speech to global elites at a ski resort in the Swiss Alps. The United States and China, the world’s two biggest economies, have imposed heavy taxes on each other’s imports in a dispute over Beijing’s aggressive push to challenge American technological dominance. Wang noted that expanded trade and technological innovations leave many behind. In response, he said in a clear reference to Trump’s America, “many countries are increasing looking inward … barriers to international trade and investment are increasing; and unilateralism, protection and populism are spreading. She said efforts to combat global problems “will only function if we are able to compromise,” citing as examples of cooperation the free trade deal between the EU and Japan taking effect Feb. 1. Merkel said Germany was committed to multilateralism starting with strengthening the EU but going beyond that. She acknowledged the “shock” of Britain’s planned departure but stressed the need for close and cooperative relations even after Brexit. Ethiopia’s reformist prime minister acknowledges that challenges remain “formidable” as the East African power seeks to overhaul its fast-growing economy and open it up to foreign investment. Prime Minister Abiy Ahmed told the World Economic Forum that sustaining growth is crucial in a country with 60 million people under age 24. He says it “requires the unleashing of the private sector” and reforming state-owned enterprises including telecoms, railways and more. Abiy urged investors to “seize the day but also trust the future” in a country that, before he took office in April, was rocked by months of anti-government protests. Be nice. And don’t wear a hoody and skulk. That’s the way to play poker, says Maria Konnikova, a psychologist, author and now champion in the game. Speaking about her success in the game and its applications to business, Konnikova told delegates at the World Economic Forum that her secret weapon is to take “time to be nice” to those seated around the poker table. Afghanistan’s chief executive, Abdullah Abdullah, urged the world not to give up on his impoverished country, which has struggled with corruption, political instability and a long Taliban insurgency. He told The Associated Press in an interview at the World Economic Forum in Davos, Switzerland: “Don’t lose patience. We all made mistakes in the past 18 years” — since U.S. forces overthrew a Taliban regime in the aftermath of the Sept. 11, 2001 attacks only to see the fundamentalist Islamic militia regroup in the years afterward. He said Afghanistan has made progress delivering education and health care to its people and could develop into an economic “land bridge” between South and Central Asia. Japanese Prime Minister Shinzo Abe has touted the benefits of two recent “mega deals” in trade. He said Japan, the European Union and the United States must work together to reform the World Trade Organization, notably on rules about government subsidies. 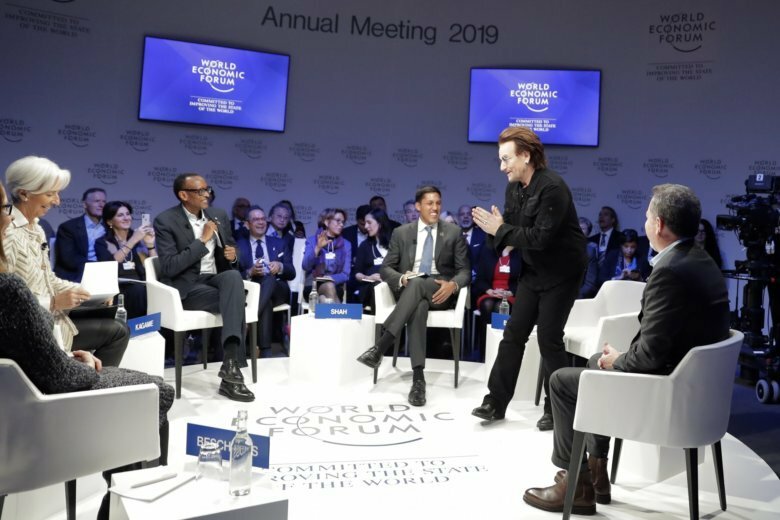 Abe’s speech at the World Economic Forum in Davos, Switzerland, marked his return to the elite gathering after five years. Guido Sandleris, president of the Central Bank of Argentina, says the country is “much better prepared” for the challenge of a slowdown in global trade and the rise in interest rates in major economies, following its recession. Sandleris defended the government’s belt-tightening measures and said protests in the country are more to do with the recession — the economy is expected to shrink further this year — than any anger against the IMF. Hong Kong’s Beijing-backed chief executive says she’s “quite worried” that the rules-based system that has governed global trade for decades is under threat.